Revival Tabernacle is a diverse, multi-generational church. We are a church of vibrant worship and passionate preaching, and we pride ourselves on making each person who walks through our doors feel like they’ve been a part of the family for years. We look forward to you joining us each week! Revival Tabernacle has been witnessing the Gospel of Jesus Christ go forth with power and demonstration for over fifty years. We are an Apostolic Pentecostal church attempting to fulfill the Great Commission. Search for Truth and Revival Tabernacle Orientation. Whether you are a seasoned Christian or just beginning your spiritual journey, Revival Tabernacle Orientation is a great introduction to this church and to the principles of Christian living. Completing Orientation is a prerequisite for joining many other ministries of the church. This lesson program welcomes new members, familiarizes them with their new church, and provides them with an atmosphere conducive to growing in a new life in Christ at Revival Tabernacle. We believe that one of the most effective ways to connect you to God, His Word, and His church is by completing a personal Bible study. We have many volunteer teachers with a wide variety of Bible study lessons and methods to help you learn the Word of God. 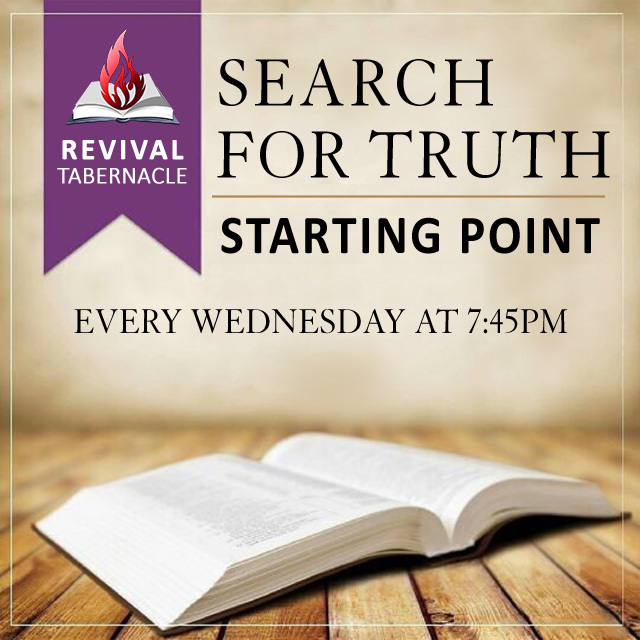 Join us on Wednesdays at 7:45pm for our Search For Truth Bible Study. STARTING POINT IS 12 Lessons. This includes the RT Orientation and Search For Truth Class. We’re genuinely excited about what God is doing at Revival Tabernacle, but we want God to do great things all over the Santa Maria and Orcutt, California, the United States, and around the world–and we want to be a part of what He’s doing elsewhere! We support missions programs in the United States and abroad, including humanitarian needs, planting of new churches, and a Bible college. We currently support missionaries in many countries with monthly offerings and prayer. Revival Tabernacle also has a Men’s Ministry, Ladies Ministry and a Homeless Shelter Ministry. You too can become involved, engaged and participate in any of the aforementioned ministries. Come and visit us during any of our services. We would love for you to experience the power of the Holy Ghost in your life!